Locals and older grad students have all been saying the same thing for the last two or three weeks here: it’s colder here in Charleston than it normally is at this time of year. I honestly thought we were past this winter groove and that spring was on its way at last. It had gotten up into the 60s only just a few weeks ago! I was enjoying going outside and the days are getting longer once again. Then, snowfall in the states to the north of us (I’m mainly thinking of good old Kentucky) starting hitting and we got the remnants in the form of rain showers. The temperatures became colder. Not as cold as Kentucky, but it was colder than I would’ve liked for living in the South. But this weekend topped it all. It snowed here in Charleston and other places in the South on Friday night. I’m not saying that this never happens or that it was impossible, but it is a very rare thing to see snow here at all, let alone sticking to the ground…and palmetto trees. Very unusual. So when we all heard the forecasters projecting anywhere from 1-5″, none of us really believed it. However, on Friday night Jena and I were over at Walter’s apartment, along with some other students, just hanging out and watching TV. Jena was worried with the possibility of having to drive to Columbia, SC (2 hrs away) to pick up her fiance that was flying in from Boston late that night. His flight to Charleston had been canceled, so after his trip to Washington D.C. (was everyone knows was pretty much like the under-the-snow lost city of Atlantis), she wasn’t sure if he’d make it to Columbia that night. Or how she would be able to pick him up. If she had to go get him, I volunteered to come along and graciously, Bekkah let me know we could stay with her that night–all the while telling me that it was snowing heavily there and they weren’t salting the roads. Jena kept a close watch on the cancellations and many flights became canceled throughout the night. His flight to Columbia was still a go, though. At around 10:30pm, the icy rain mix that had been falling quickly turned into huge flakes of snow. And it wasn’t just snowing gently, it was heavily snowing with heavy wind gusts we could see as the snow fell underneath the light of the apartment complex’s street lamps. Anyway, her fiance ended up spending the night at Columbia’s airport, and for the life of me, I have no idea why they just didn’t cancel that flight too. Kind of ironic he was flying from Boston–the northeast that is notorious for foul winter weather–to the South–a place where everyone panics when they see a snowflake–and that just happened to be one of those rare occasions that there was a snow storm down here. The power did flicker a couple of times at Walter’s, but we willed it back on. The power at the dorm went out briefly, but thankfully it was back on by the time we got home or we were planning on sleeping over at their apartment. The insulation in this 80 year old building is horrible. If I even just turn off the heat in my room for 5 minutes, it pretty much all escapes outside. The article also talks about the Piggly Wiggly on Harborview Rd., James Island–which is where I do most of my grocery shopping. It’s closest to the lab. I was there earlier in the day on Friday to get some milk because I was out, and decided to just go ahead and buy the rest of my groceries for the next 2 weeks. I can attest that there were a few more people there than usual, and I went at about 11am. Well, we all know the age old story of Southerners and snow: buy up all the milk and bread! 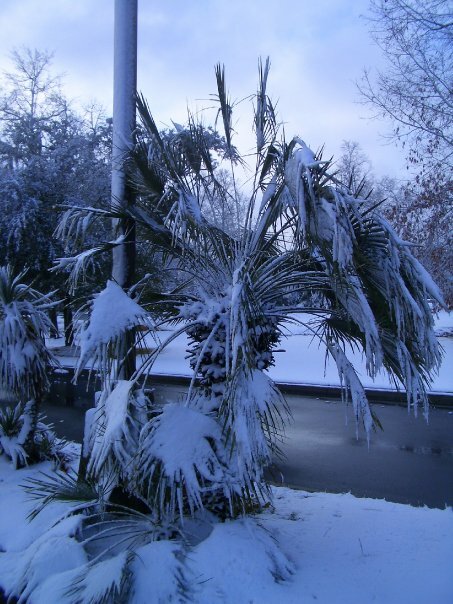 One of the many palmettos around Charleston that sunk under the weight of snow...leading to many power outages across the Low Country. Beautiful pics! 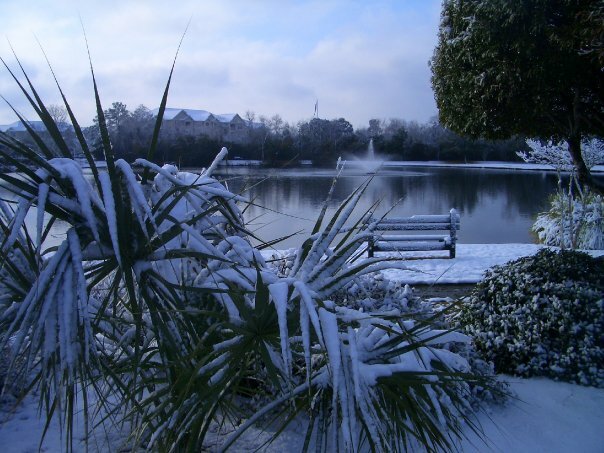 Palmettos and snow! How nice to live where this only happens once in awhile! Unlike right now in Kentucky, where some remnants of the last two snows hadn’t completely disappeared until a new one last night with rain before it leaving ice under the snow on the roads. Will be glad for summertime!! !